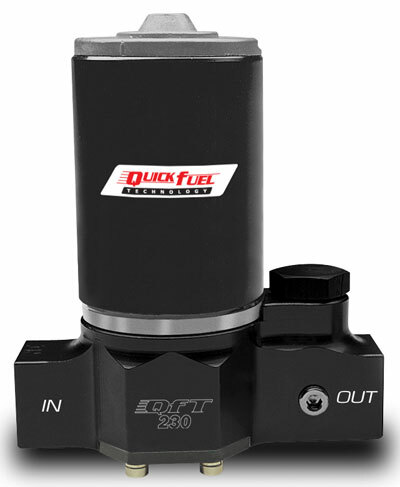 Quick Fuel Technology™ high output Pro-Series billet fuel pumps are designed with increased durability and serviceability along with a new vane and rotor design that delivers a greater volume of fuel in the all important 12-20 psi range. Designed for street performance vehicles; Supports up to 1200 HP. Comes with 30-1900 Bypass Regulator included. Motor draws 5.5 Amps @ 7 PSI. Hard coat anodized billet aluminum housing. DYNA-BLUE® wear resistant coating applied to all critical internal parts for added durability and longer life. #10 AN Inlets and Outlets. Armature shaft made of 316 stainless steel for corrosion protection. Compatible with all fuels (Gas, Alcohol, E85). Rebuild kits available for servicing pumps. Flow, pressure, and leak tested prior to shipment.